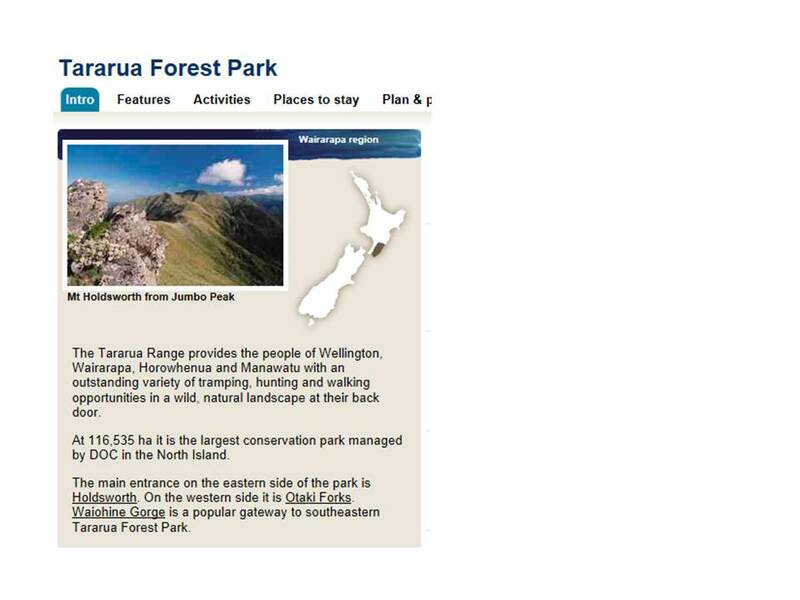 This website collects the Fastest Known Times (FKTs) for the numerous routes available within the Tararua Ranges. Note times listed in routes are for running/fastpacking not tramping. Ratify Colin Rolfe as the first person to run SK in sub 24 hours. Colin Rolfe, the first member back in 1995, was conducive to the idea so an SK night was organised for (appropriately), the 24th (May 2016). Colin made the effort to fly up from the South Island and headed a line-up of talks from some of those 11, all sharing their uniquely personal experiences to a packed Southern Cross back room of appreciative punters from the tramping and running community. The evening ended with Colin presenting the newly made members’ certificate to nine of the eleven present who have managed to attain Kaitoke before the watch clicks over the 24. Next certification evening 24th April 2018. Two certificates are being handed out. Could you be number 16? Happy safe ridge running. Here is the video footage of the evening with presentations by members of the club. 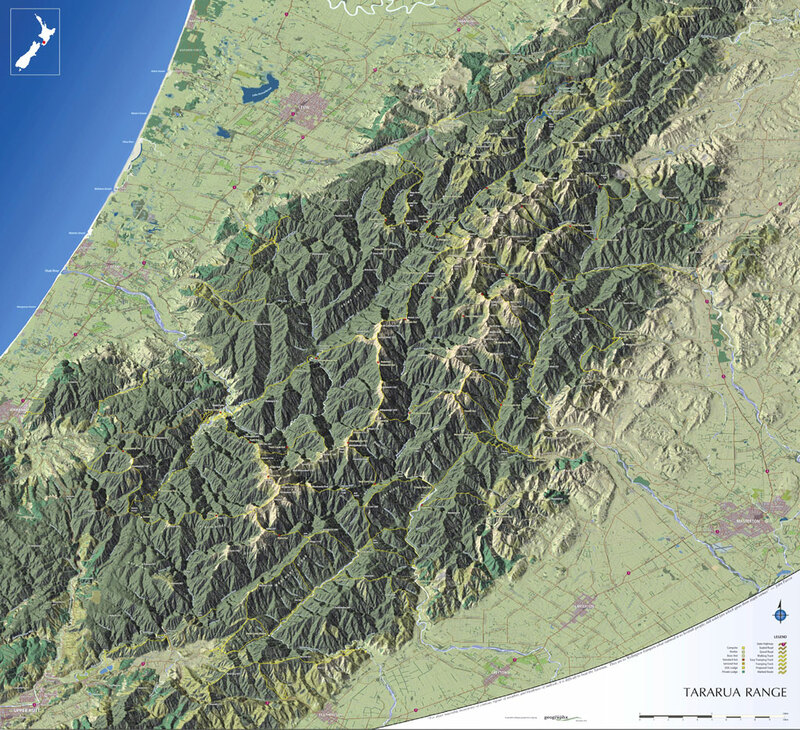 Where is the Tararua Range? It is the intention of this piece to offer some background and perhaps history to aspects of the range and some particular routes within it, notably the S-K, or Schormann’s – Kaitoke, a route considered by many to be one of the most challenging in the park. I am no expert, nor historian and many out there will be better equipped and more experienced than I to comment on such matters, but the Tararuas have enticed me in, fostered my intrigue, stimulated my ambition, satisfied some desire for adventure, bullied me into submission and pushed me towards my limits. Overall though they have been a place of enjoyment, challenge and camaraderie, of experiences shared and a place where I’ve enhanced my appreciation of our wild surroundings. And then spent a pleasant afternoon reading accounts from way back, written by enthusiasts who had tested themselves along the range. These publications will give you much more insight and information about the routes and history of the S-K than I am about to. Whether you are planning an attempt, wondering whether you could or simply intrigued and want to know more, go dig out a copy and learn some more. Before I gave the route a go, the Cuthbertson and Jagger 1997 edition became a much referred to source for inspiration and advice. 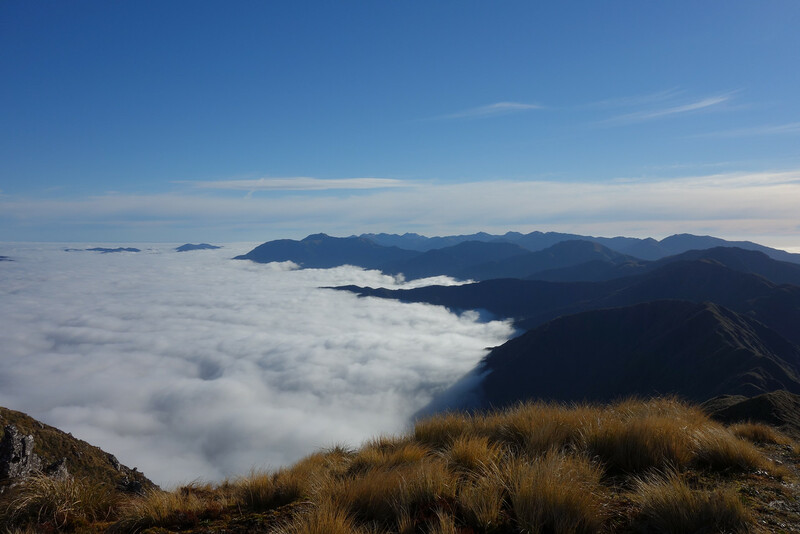 The prospect of completing a north – south traverse of the Tararua range seemed to have been conceptualised way back, but like many of these ideas it was not given a solid attempt immediately. The challenge from the off seemed to be the unwritten notion that an S-K assailant should aim to leave work on a Friday night and be back in on a Monday morning having done the route in-between times. The first to record such a feat is thought to be Bruce Jefferies and Dave Capper in 1963. There are many ways one could get from the Putara Road end (where the route begins) to Kaitoke, but three main routes are considered by most. The first, by the valleys, travelling the rivers via the Waingawa, the Waiohine and finally the Tauherenikau. 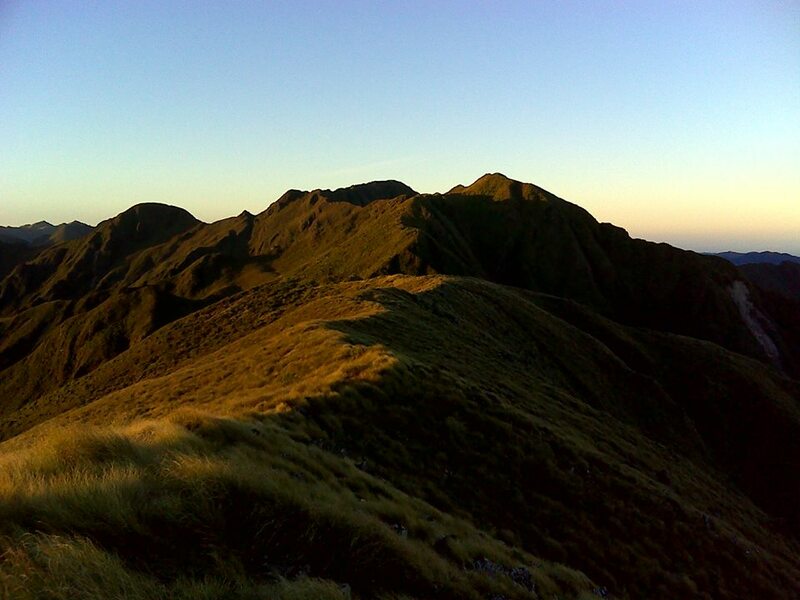 The second, via Tarn Ridge and finishing down the Tauherenikau. 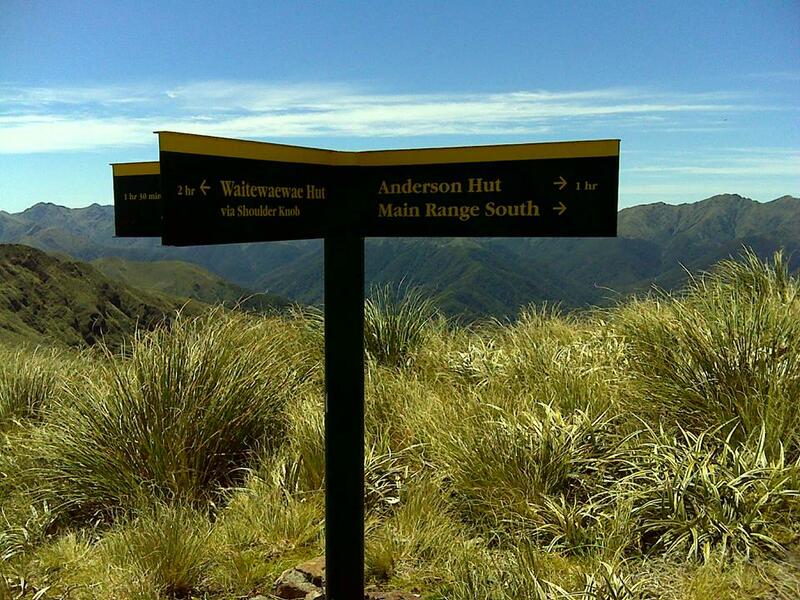 The third, via the Main Range, traversing the western range from the Dundas Ridge, down the Southern Main Range finishing with the Southern Crossing. It is this third route that is considered to be the most challenging due to it’s length, total vertical climb and general exposure to the elements. It is this route that I am most familiar with and refer to now. Map of the Route here…. With weekend S-Ks being completed fairly regularly by fit trampers, human nature grabbed a few ambitious souls by their laces and encouraged a no sleep approach with a view to knocking off the Main Range S-K sub 24 hours. Roger Coventry in 1975 seemed to be the first to give this method a good go arriving at Kaitoke 28 hours after leaving Putara, commenting in his write up afterwards, ‘that the prospect of a 24 hour SK is not such a dream after all’. Gary Goldsworthy in 1988 gave the route another fast pair of feet to contend with and came tantalisingly close to breaking 24 hours, arriving at Kaitoke 25 ½ hours after leaving Putara. Rob Camden in 1995 knocked off a Main Range S-K in one hit, taking 31 hours to reach Kaitoke from Putara Road. These three meritorious performances were all undertaken solo and unsupported. Later in 1995 a man familiar with the Tararuas mustered some support groups, had a big breakfast and set off down the main range from Putara Road. 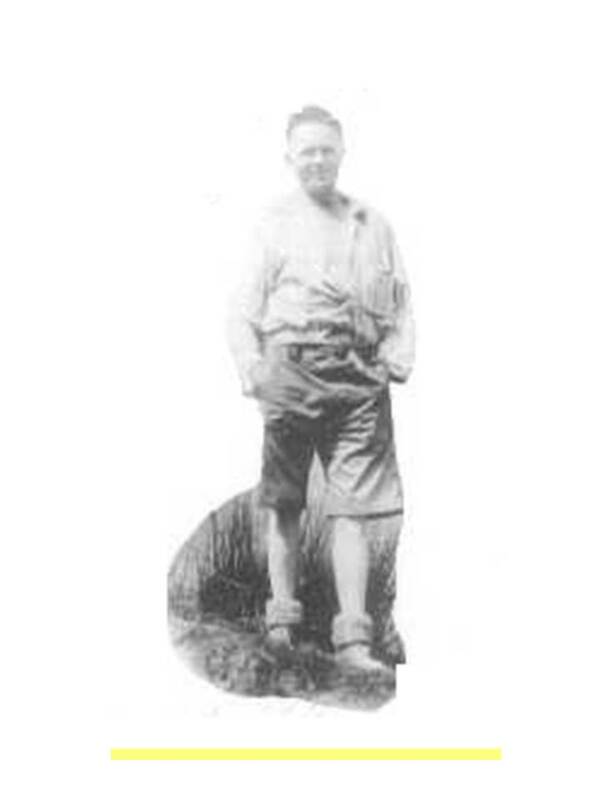 Colin Rolfe arrived at Kaitoke 22 hours 59 minutes after leaving Putara Rd, with many an unforeseen hurdle on route to contend with. The 24 hour barrier had been broken, giving credence to Roger Coventry’s postulation from 25 years earlier that such a feat was indeed possible. 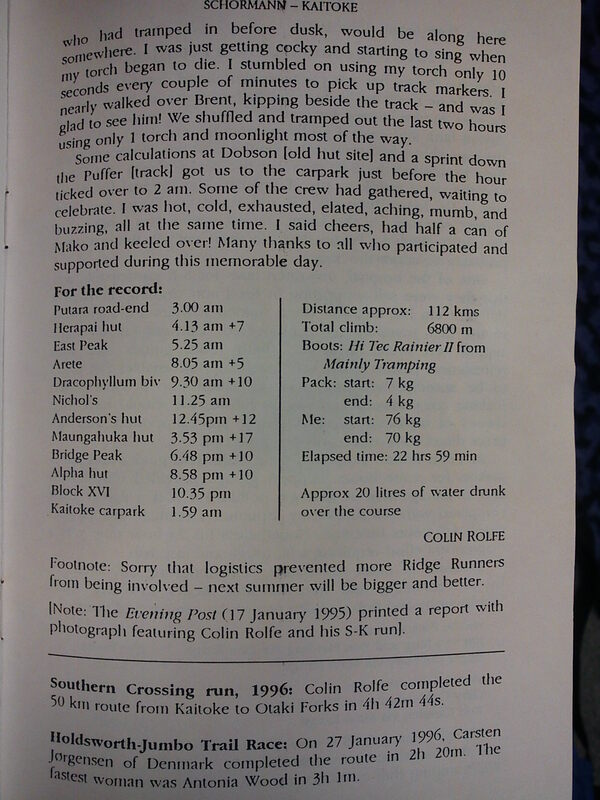 It took 18 years for Colin’s record to be beaten and once again the range tested the assailants; I know much about this day as it was my good friend Laurence Pidcock and I that arrived at Kaitoke 22 hours 12 minutes after leaving Putara Road. Our accounts are hosted on this site should you wish to read them, so I will not dwell here with details, except one. We tackled this test in a supported and paired fashion, meaning we had the assistance of some of our friends, members of the Wellington mountain running community willing to offer their time to assist us on the route by taking food to various sections for us. This enabled us to travel as light as possible, a method designed to maximise speed and, it seems, to inadvertently stir up opinion as to how such matters should be tackled. The controversy we attracted from some was to my mind fairly surprising. I am not one to overtly run in the face of tradition but it seems some folk couldn’t see that our deviation from solo and unsupported was, if anything, a compliment to those that had gone before in such a fashion as we chose a perhaps less challenging method of attack. Sure, travelling light brings the challenge of speed and maintenance thereof. But it also takes away many facets of solo travel such as carrying extra weight, maintenance of morale when the inevitable dark spots arise and the backing of one’s judgement of pace and navigation decisions with nobody else to call upon for a second opinion. I think about parallels that can be made between styles of ascent in mountaineering: the siege tactic of formal advance camps cached with supplies and then the ‘purer’ alpine style where the assailant carries all their gear for a rapid siege on the mountain. Or rock climbing; ‘sport’ climbing where one man clips into a bolted wall, compared to ‘trad’ climbing where the gravity defeater carries cams and quickdraws up a face, all the time looking for suitable protection points to place their gear. If sports didn’t progress, or traditions weren’t built upon, we’d still be climbing Everest wearing a shirt and tie beneath a tweed suit, swigging a slug of rum to warm the blood, eschewing supplementary oxygen as an unnecessary and illegal performance aid! Styles of attack are different and distinct and should be viewed as such; they bring about different challenges, in these cases none of them easy and therefore deserve to be recorded and appreciated, and for others to draw inspiration from. (find out more here: http://www.bobgrahamclub.org.uk/). It is a 24 hour challenge on a route that is longer, with more vertical climbing and in my mind harder than the S-K. With the current membership list up to the end of 2013, only 1848 (since 1932 when it was first completed by Bob Graham) people have completed the round in the specified 24 hour period. Why do I mention this? Because almost all of those 1848 people completed the route with support and pacers. Why? Well, in my opinion, on an arduous and demanding day in the mountains on a route of this length, to get ‘around’ in under 24 hours many a mortal will need every inch of psychological and physical help one can be offered while still putting their own feet one in front of the other. Sure there are remarkable exceptions to the rule who seem to muster depths of strength others can perhaps aspire to, but for most, attacking such a challenge solo will not bring about their desired outcome of a sub 24 hour achievement. There are links on this site to more formal descriptions of what constitutes supported, unsupported, self-supported etc but I would like to take this opportunity to echo Peter Jagger’s sentiments when he asked, ‘Will tramping club members carry on the challenge of the S-K?’, but I’d like to add, if you are going to take on the challenge, do it in whatever style you feel suits you best and don’t worry about what a minutiae may think. Eventually those that critique such attempts that deviate from their own perceptions of what is true and correct may come to realise that no SK is easy! And it is perhaps better to embrace evolution for what it is: a different style of approach to a traditional challenge. As Peter Jagger so rightly said, “all accounts record fitness, effort and determination to traverse the SK, ‘just because it’s there’”. The challenges of differing approaches are distinct and different and what works for and appeals to one may not suit the next. It seems the ‘dawn of sub 24 hour SKs’ may have arrived as mountain runners sense the challenge and approach with keenness to give it a go. With the first being attained by Colin Rolfe in 1995, it took 18 years for the next sub 24 hour S-K to happen. Since December 2013 there have been three more Main Range sub 24 hour SK successes. In November 2016 Sam McCutcheon and Danny Garrett set the new SK Main Range FKT in 18 hours 15 min after leaving Putara Road. Since the originals, 19 more people have completed the route in under 24 hours.to make 20 the number in the sub 24 hour club… Could you be the 21st? The full list is on this website. It is worth noting that any tramper or runner who has attempted an S-K will vouch that it is is an exposed and potentially dangerous route subject to extremely volatile weather conditions and navigational challenges, and therefore give the Tararuas the respect they deserve. Equip yourself with the knowledge and tools to tackle such an endeavour safely. Please refer to our safety section on this site for some advice and do your homework. Good luck, go take up the challenge! Really really cool to view the vids for the celebratory evening and check out this outstanding website. Colin hasn’t aged a bit! 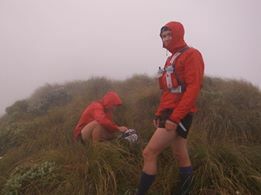 What a fantastic initiative to initiate a Kiwi version of the essence of the Bob Graham Round. You’ve set a real challenge for adventurers here in NZ and further afield. Cheers! Yo Marty! Thanks alot! We are so stoked here in welly as we have a great group now of adventurous types. Would be great if you can spread the word…Or give it a crack yourself? Any interest? Do you know of anyone keen? Plus did you loop Ruapehu one year?? Good to hear you guys are keen and the ball rolling. Good news is I think you’ll get keen Mainlanders up to follow in Matt and Grant’s footsteps. The challenge will be going into your hills, for the uninitiated, as our terrain is tussock / rock / dry beech. Tararua mist and mud is just off our radar. Would love to give the SK a crack sometime. I used to do HVTC Trips in the 1980’s and Gary Goldsworthy was one of those early inspirations. Last summer I did get around Ruapehu / Tongariro from the Turoa Rd. Top day out. Highly recommended. 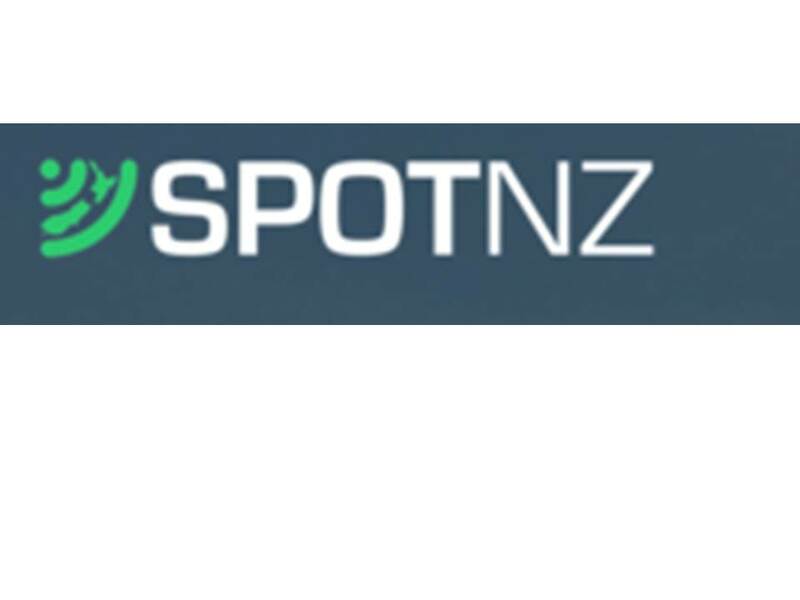 I think a few of us down here are going to have to create some South Island challenges…. watch this space! Thanks Chris for that update; I’ll pass that on through our Sumner Running Website and WildThingz too. Bring on those summer adventures! Hey mate. I was just wondering if there was a FKT for the Tararua section of Te Araroa? Poads Road to Otaki forks. I fast walked / jogged through it yesterday in total time 10:2x (need to check watch/ photos etc). It’s quite a good section I reckon…. for those who aren’t quite ready for the SK. I started with James Coubrough but he turned back near pukematewai. I could give you a detailed account by email if you think people would be interested? What do you think? How many words would be best?